Surges can arise from switching of nearby heavy electrical equipment is LAN Protectors from the clearance of an electrical short circuit fault (e.g. by a fuse blowing), but the most potent source is lightning. At a lower level, but more insidious, is latent damage to semiconductorswhich subsequently fail perhaps months later, as can happen withelectrostatic discharges.You can ill afford costly repairs or down-time due to damaged equipment. Yet transient surges can pose a major threat to any category cabling system. The surge protectors sensitive data ports without degrading network performance. 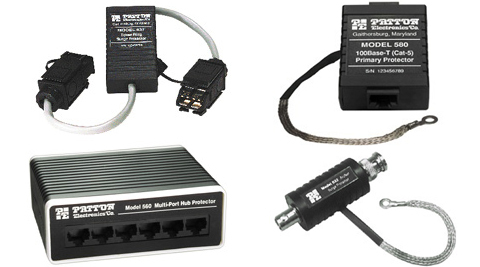 These protectors designed for installation at the point of use or at barriers (patch panels, wiring closets, etc.). Transient energy on all ports is diverted safely to chassis ground.